인터내셔널 마켓 플레이스의 매장과 레스토랑 이용 시 다양한 혜택을 받을 수 있는 쇼핑 패스포트를 놓치지 마세요. 인터내셔널 마켓 플레이스 1층 쿠히오 거리의 고객 서비스 데스크에 이 페이지의 인쇄본 또는 휴대폰 화면을 제시하여 요청해주시길 바랍니다. 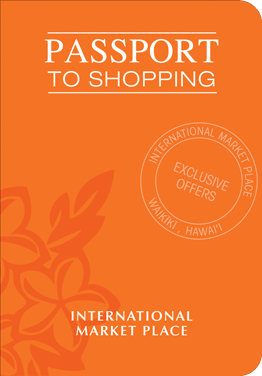 Present MyHawaii coupon at the Customer Service Desk on 1st floor Kuhio entrance side of the International Market Place to receive a copy of the Shopping to Passport.